Since the year 2000 erscheint der Kalender bei uns im Verlag. Historical Views of Nordhausen in the form of viewing- and Photo Cards or. 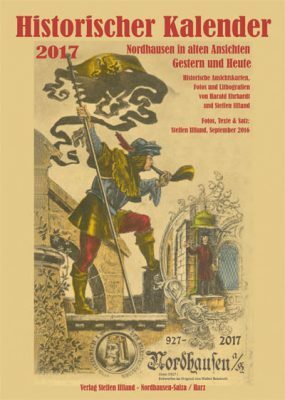 historic lithographs presented in this publication. Here you can really call it a huge success, to this publication in no time experienced. The demand for old & views is rare in Nordhausen very large, especially since the historic Old 80 Percent of the bombs (1945) fell victim to. Even after the first edition after the demand has increased steadily, so every year with a circulation of 1000 Each is necessary. The layout has changed slightly over the years. Since 2007 we the old recordings over a photo from today's perspective, so that any lingering doubts or questions are excluded to the site. To meet the desire many customers, we have the calendar greatly reduced in this issue and housed more historical information. Hier geht es zur Bestellseite. This entry was posted in General, Regional, Publishing house and tagged with Pressure & Publisher Iffland, County of Hohenstein, Nordhausen of ifflandnordhausen. Bookmark the permalink.